Renewable Energy Resources: WHAT They Are? In contrast to fossil fuel energy sources like the oil, natural gas or coal that is limited, renewable energy is energy from a non-nuclear source that is forever available as long as the solar system exists. However, there are five distinctive renewable sources of energy that are available in our planet and they are (1) the sun; (2) the wind; (3) heat from within the earth; (4) flowing water and (5) biomass. And now let us see how each of these renewable energy resources helps us in our day-to-day life on the earth. The sun provides us with solar energy which is a steady natural source of heat and light while its radiation can be converted to electricity through photovoltaic cells. The sun is also an indirect source for creating wind which is another renewable energy source. When certain portions of the earth’s surface including land area and water body get unequally heated up by sunrays, the air above the portion that gets heated up more than its neighboring area loses its density and goes up. This creates a temporary void in that area when air from the adjacent area rushes in to fill the void. This phenomenon commonly called the Thermal is responsible for wind velocity or wind power. As earlier said, wind is created due to Thermal as also on account of the earth’s rotational force on its own axis which drags the immediate surface air with it. However, the air on the higher level does not get affected on account of the rotational force and the resultant clash between the two wind forces give rise to turbulence and storm. Storm can be caused due to other factors as well. However, the wind velocity created by Thermal or other factors have been utilized by people since time immemorial in several ways. Sailing ships toiled through the seas with wind on their sails while the early Persian built windmills to grind corn or to lift water. Wind turbines driven by wind energy now generate electricity in most <?xml:namespace prefix = st1 ns = "urn:schemas-microsoft-com:office:smarttags" />US homes and ranches. The earth during its formation days consisted of round mass of molten lava. Although it took billions of years to cool down and bear life on its surface, its inner core is still very hot. Called geothermal energy, this heat is sometimes found close enough to the earth’s surface when it can be reached by drilling a well near about. Geothermal energy can also be used to generate electricity. Not unlike the wind, flowing water is also a form of energy that is created by the earth’s climatic conditions and its topography. Mighty rivers and streams rush down to the plains from high mountains where they form due to heavy accumulation of snow or incessant rains. The force of the flowing water is now harnessed to generate hydro-electricity with the help of hydro-turbines. In fact, it is the water energy that actually runs the turbine. Biomass encompasses plants, trees, vegetation, grass and in fact, all organic matter available on the earth. It is also a renewable source of energy as solar energy, through photosynthesis is continuously creating new organic matter in plant life. Biomass is sued to generate heat which in turn can generate electricity. It is also used to produce liquid fuels. Among the renewable energy resources, wind power has become very popular in recent years not only because it is a safe and clean energy but also due to the fact that the cost of wind power is less and it is hassle free. The benefits of wind power are both financial as well as ecological and that is why governments of many countries are promoting this. 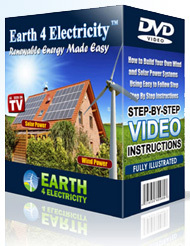 You can also set up a system at home to make your own power. All you need to do is know certain things that include where to set it up and how to do it, how to wire the system, where to get the parts from and also the safety precautions. Here is a guide that gives you all this information.